Summer is here at last, and this means lots of fun in the sun for us and our doggy friends. While long summer days playing outdoors produces many priceless memories, it can also create hidden dangers for your pet. As the temperatures warm up, it’s really important to consider the following necessary safety tips to keep your dog safe in the summer sunshine. Never leave your dog inside the car. Parking in the shade and leaving a window slightly open does nothing to lower the inside temperature of the car. A few minutes inside a hot car can be fatal for your dog. Try to avoid any car journeys in hot weather, but if you need to take the car, avoid the midday sunshine. Fit a sun blind inside the car window, and always ensure you have a supply of fresh cool water for your dog. Buy a pet sun screen – visit your pet store and choose one specifically for dogs. 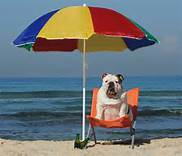 Do not use your own sun screen as this can be toxic for pets. Apply to the dog’s easily burned areas such as nose, paws and ears. Be sure to cover the belly on short haired breeds. Make sure the ground is not too hot for your dog’s paws, as they can burn. Check the heat of the pavement with your own hand or feet first. Try to walk your dog either early morning or later in the evening when the sun has gone down. The sun’s rays are hottest between 10am – 4pm. Ensure you have a fresh water supply for a drink for your dog – it’s possible to buy a portable water carrier that doubles up as a drinking bowl. Most dogs love water but if you allow your dog to take a dip in a swimming pool or a lake, rinse him as soon as possible afterwards. Take care if your dog tries to drink from ponds as the water can contain toxic algae which will upset your dog’s stomach. Add ice cubes to water in his drinking bowl. Other ways you can provide protection from exposure to the sun, is by keeping them inside during midday sunshine and by providing shaded areas for them to lie and play when they need to be outside. Always make sure they have a plentiful supply of fresh drinking water. A child’s paddling pool is a great solution to quickly cool down your pooch, while having some playtime fun. Contact your Vet immediately if you notice any of these symptoms. Heat Stroke is very serious so don’t let your pet become a victim! Who doesn’t love a cooling, ice cream treat on a summer’s day? Why not make this special doggy ice cream to keep your pet cool. Blend together 3 ripe bananas, 80ml natural yoghurt and 5 tablespoons of peanut butter. Scoop into ice cube trays and freeze for a delicious, cooling treat for both you and your pet. Your dog will love frozen peanut butter – try filling a Kong toy for hours of cooling playtime. Or freeze blueberries or other small treats in ice cube trays. Plain veggies like sweet potato or green beans, will freeze and make a great snack, as will ice cold apples, strawberries and bananas. If you’re away from home all day leaving your dog in the house, alone, ensure that the rooms that your pet has access to are kept cool. If you don’t have Air Conditioning, we would recommend you consider Day Care for your dog. You will have peace of mind that your dog is well cared for, has daytime company and that he will get outside for plenty of walks and exercise. Contact Finchley Dog Walker and Pet Sitting Services for further information.